When I travel I like to pick up stamps as nice little souvenirs. 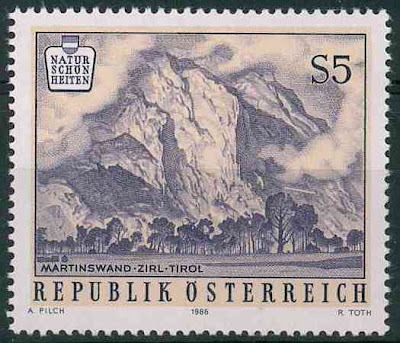 Stamps can reflect so much of the place that you have just visited, and as a bonus, they don't take up any space in your backpack. Perfecto. A perfecto memento, you could say! Mozart in Salzburg in 2006! 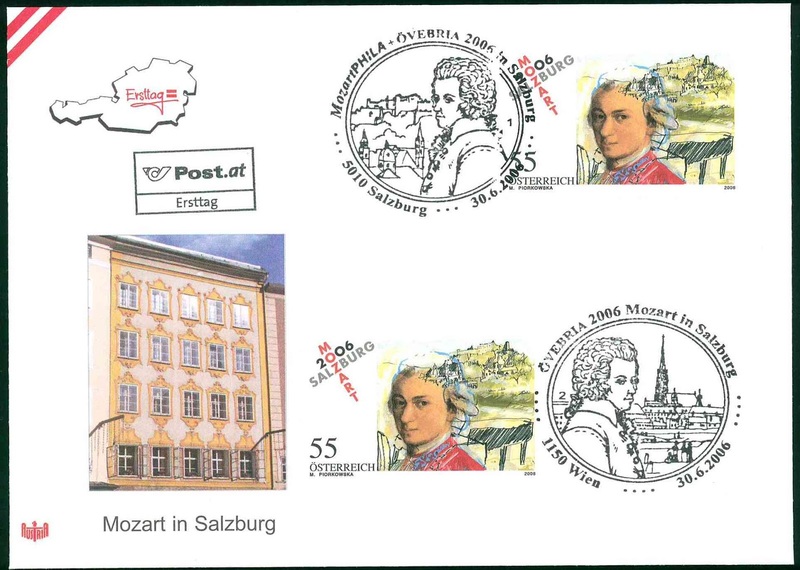 So when I was in Austria in 2006 I hunted down a little cavernous stamp shop, down a little cobbled street, (at least that's how I remember it). I had to buy the above Mozart first day cover, because my sister Emily and I had not been able to escape the presence of the great maestro during our stay in Salzburg. He was everywhere. On chocolate wrappers. In museums. On banners in the street. On post. 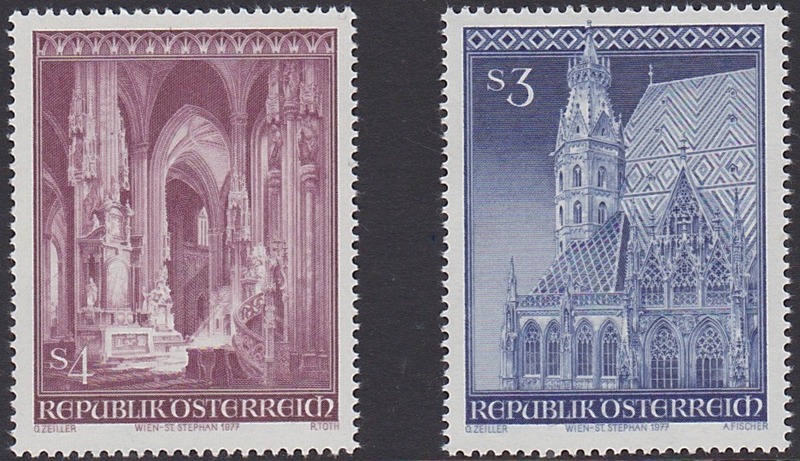 I also bought the above beautiful set of stamps from 1977 which depict St Stephen's Cathedral. 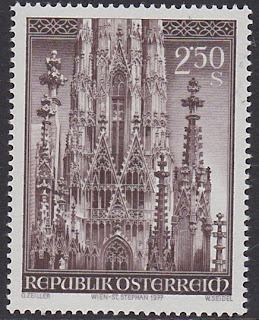 The cathedral, which is a striking landmark in Vienna was unfortunately being restored while we were there, which meant it was partially obscured by scaffolding. You can't tell from the scans, but the stamps are quite large - appropriately imposing for such a grand cathedral. 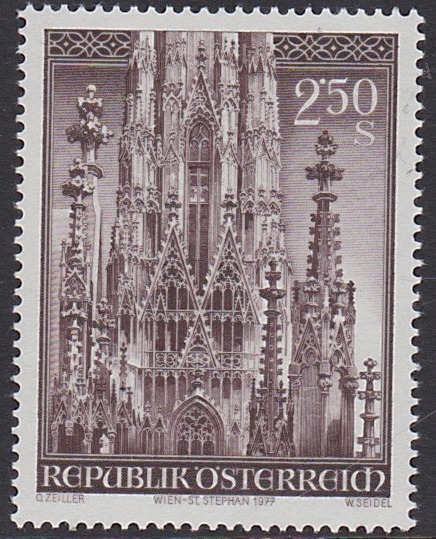 And the stamps let me appreciate the icon which I didn't quite get to appreciate while I was there, due to all the pesky scaffolding. 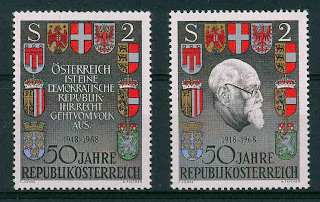 Pariser Postkonferenz 1863-1963. Paris Post Conference - my type of event, I should think. Admittedly, some stamps I just bought because they appealed purely and simply for their aesthetic value. 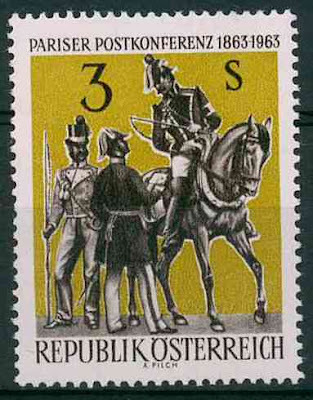 The Pariser Postkonferenz 1863-1963 doesn't represent anything of my stay in Austria, but it is one damn cool stamp. Check out the hats, for starters! And the mustard background. What a great image. 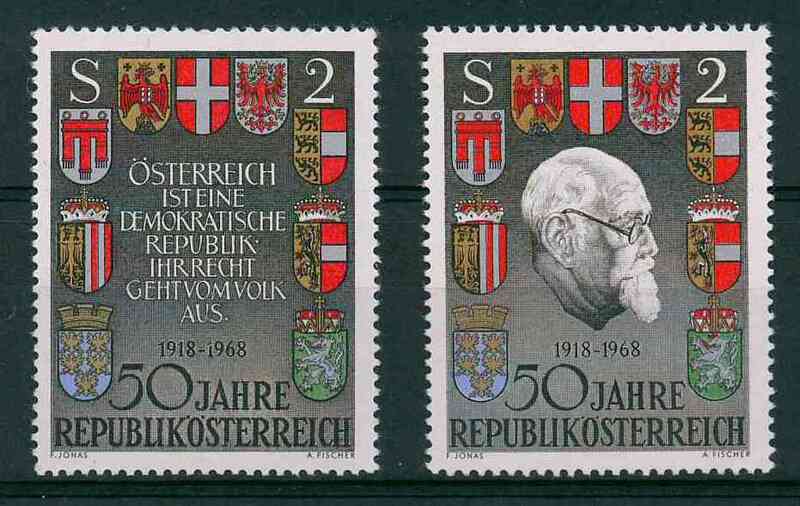 The same goes for the commemorative stamps celebrating 50 years of the Republic. I like the crests that feature in the design, but more than that, the stamps are textured due to the printing process, so they look and FEEL pretty. I also bought two stamps that feature the art work of Gustav Klimt. 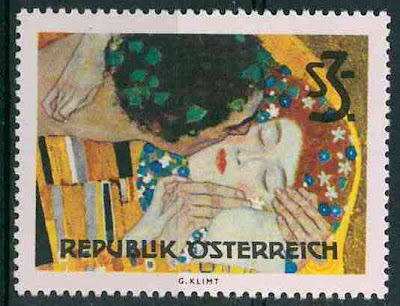 These stamps represent something of my holiday, because we visited art galleries in Vienna and saw some of Klimt's work (which I love love love) - but being miniature works of art themselves, they also tick the aesthetic box. My favourite Austrian stamp, though, is not actually in my collection. I sourced it on ebay, but then gave it away as a gift (post makes brilliant gifts, I think). 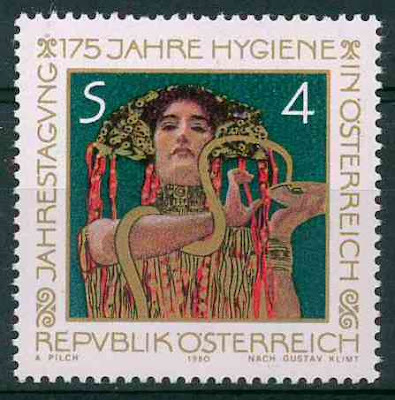 The stamp depicts the sculptor Anton Hanak, who was a contemporary of Klimt. I used the stamp as an illustration in a research project for my Masters, which was last year published into a lovely little book by the Duldig Studio. Hanak was the teacher and mentor to two young sculptors in Vienna, Karl and Slawa Duldig, whose home in Melbourne is now a house museum. Hanak is not very well known in Australia, but this stamp shows that he was acclaimed enough to warrant a stamp from his homeland, and thus the stamp made it into the book. So how about that... without even being totally conscious of it, I managed to wrangle some post into my first book! 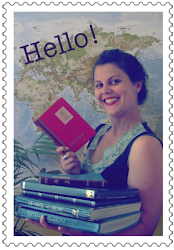 * That is how much I love stamps and post! Once again, absolutely brilliant. I learn something knew every time I read your blog. I'm hoping to stow away and get to Europe next week. If I pull it off expect some post from the Renaissance Monkey in Vienna very soon!